Now you can get that “New HOT TUB” look, for a fraction of the cost of a new hot tub. Our hot tub Cabinet Panel Restoration Service, includes the replacement of the old cabinet panels, for new Spa Cabinets so that you can keep your hot tub looking brand new. The Spa Panel Restoration Kit used on most major brands of spas can now be installed on your hot tub as well. Our hot tub refurbishing system has been used on brands such as: Arctic, Baja, Beachcomber, Bullfrog, Cal Spas, Dynasty, Endless Pools, Jacuzzi, L.A. Spas, Marquis, Nordic, PDC, Saratoga, Sundance, and more. An innovative design including back panel insulation. 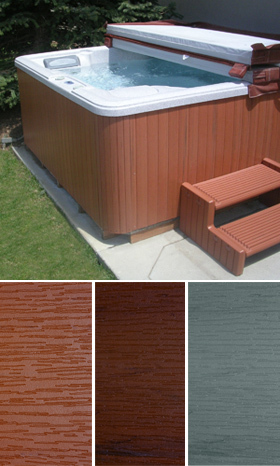 The exact same material that sold to the world’s leading hot tub manufacturers and that is used from coast to coast. Waterproofing and UV resistance for years of worry-free use. We also offer refurbishing services for the hot tub itself. This includes structural restoration, jets and pillow replacement.